Apartment rents climbed sharply in the Greater Toronto Area in 2017 as population growth and low supply pushed vacancy levels below 1 per cent. The Toronto Real Estate Board (TREB) said the average rent for a one-bedroom condominium apartment in the GTA climbed to $1,970 in the final quarter of last year, while rent for a two-bedroom condominium apartment rose 8.8 per cent to $2,627. TREB president Tom Syrianos said the demand for new rental accommodation is continuing to grow in Toronto as the GTA’s population continues to rise. The competition is so fierce that some landlords are seeing bidding wars emerge as prospective tenants offer to pay higher rents than the posted rate to win the apartment. Competition “has underpinned very strong growth” in average rents, Mr. Syrianos said. TREB said the number of condominium apartments listed for rent through the MLS system in the fourth quarter fell 3.4 per cent compared with the same period in 2016, and the number of units leased fell 0.7 per cent as a result. 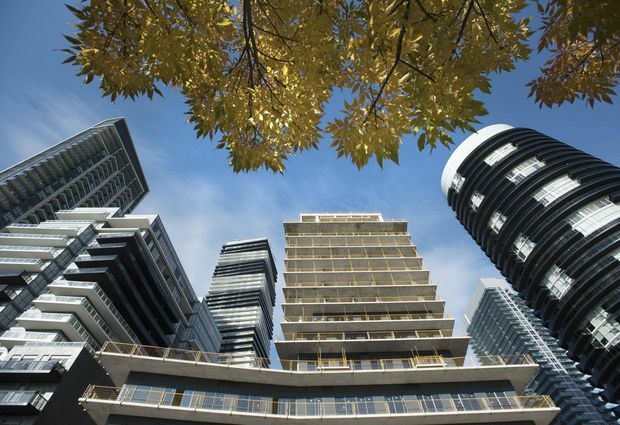 TREB said Toronto’s vacancy rate is below 1 per cent for condominium apartments, so every drop in new listings translates into a dip in new lease agreements signed. Jason Mercer, TREB’s director of market analysis, said he is concerned that Ontario’s moves last April to expand rent-control protection for tenants will slow the pace of construction of purpose-built apartment buildings and new condominium units aimed at investors. Mr. Mercer said some condominium owners could also choose to sell their condos and take advantage of the runup in prices rather than continuing renting under the rent-control restrictions. But some relief for renters may be on the horizon. Urbanation Inc., which supplies data and analysis on Toronto’s condominium market, recently reported that 7,184 new purpose-built rental units were under construction in the GTA at the end of 2017, the highest level in more than 25 years. Builders launched construction on a total of 3,644 units in 2017, Urbanation said, while the inventory of proposed purpose-built rental projects climbed to 33,787 at year-end. Urbanation senior vice-president Shaun Hildebrand said strong demand and rising rents are encouraging developers to move forward on rental projects. “This has raised the confidence of developers to add more units to the pipeline, a trend that will need to continue in order to meet future housing needs for the GTA,” he said in a statement. TREB also reported Monday on trends for townhouses listed for rent through the MLS system, which tend to have lower rental rates than apartment-style condominium units because more are located outside Toronto’s downtown core in other parts of the GTA. Townhouse units have seen a more modest rate of rental price growth in the past year, with the average rent for a one-bedroom townhouse rising 3.4 per cent to $1,726 in the fourth quarter, while rents for two-bedroom units rose 6.8 per cent to $2,115 and three-bedroom units rose 0.7 per cent to $2,301. The comparatively more modest rent increases occurred as available listings for townhouse units grew. TREB said the number of townhouse units listed for rent climbed 7.3 per cent in the fourth quarter. Urbanation said Toronto had the lowest level of condo rental turnover last year since 2013 as high rents and new rent-control measures led tenants to move less often, further reducing supply of rental units on the market. Urbanation said the average time between same-unit lease transactions was 22.8 months in the fourth quarter of 2017, up from 16.4 months two years earlier.